And when I get it in my head to paint, I PAINT! I wanted to do the dining room and foyer, so last weekend I started it. I got it all done but one wall and needed to get more paint. So Monday I picked up another gallon, yes a gallon, for one wall, they don't sell half gallons anymore. So I decided to use the rest of it in the laundry room. It's perfect in there, and I had exactly enough to do the laundry room. So I've completed those two rooms. I also picked up paint for the kitchen today, so tomorrow I'll start on that room. 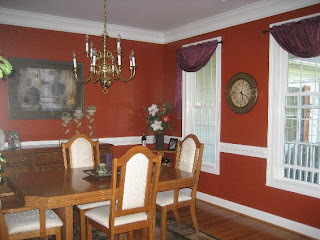 But I'm so pleased with the color in the dining room, it really shows off all the white trim and the pillars. Now the only thing I have to do is get my new light fixtures and I'll be done with that room! 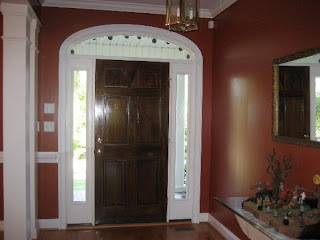 What's the color you used in the DR and foyer? Sitting in my office, it looks almost exactly the same as my walls! It looks great! Did you distress your kitchen cabinets? I want to paint ours black...I'll have to share my design idea with you at the tally rally. I'm brave when it comes to paint! haha! OMG!!! I am looking at the colors you have chosen and thought...wow! those are very similar to mine...I have a sunflower yellow in my kitchen, a step down to a lemon frost in my living room and a great rich burgundy in my dining room!! !